Concierge security has been a hugely sought-after security option for apartments and office buildings due to the added advantage that they offer. It pertains to hiring security guards who are capable of addressing front desk queries in addition to securing the property from burglars and other anti-social elements. Such services are extremely popular at hotels and resorts. The duties of a concierge in a resort or an apartment would typically include greeting guests and answering their queries, directing them towards the security check, and being aware of the rules and regulations of an establishment. 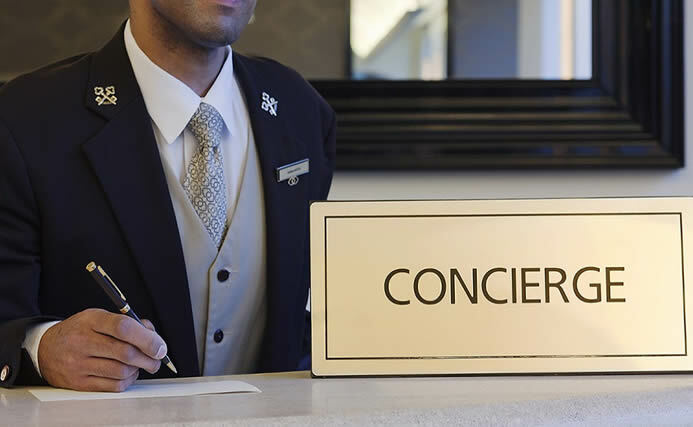 Concierge duties differ from place to place depending on the nature of the establishment in which they are required. Our Resident and Package Management module provides a cost-effective solution, empowering concierge personnel to handle tedious responsibilities, while providing you with tools to control the processes. Our technology enables us to make information automatic and systematic, so our personnel knows exactly what to do in any given situation. It keeps detailed track of the flow of people and activities, so the risk of incidents to your property or your residents’ property is minimized. Our staff is trained to watch out for any suspicious activities while on the job. They also ensure that unauthorized people are not allowed to enter an office or a residential building. Parcels and mail are handled professionally. Our staff members familiarize themselves with schedules of mail delivery and keep a track of every parcel that goes in or comes out. They are trained enough to spot suspicious packages and prevent them from reaching the residents or guests. An emergency needs to be taken care of before any external forces come to aid. Our staff is well-versed in providing emergency help to residents, staff and guests when the need arises. Our concierge staff is well-trained and professional in its approach. They are capable of greeting guests politely as well as in removing a troublemaker from the premises, should the need arise. They are trained to the highest levels of security awareness, theft prevention and client protection.